Riding bikes in Playa del Carmen is a fantastic way to enjoy the area. With the blue skies, warm sun an pleasant ocean breeze, riding bikes in Playa del Carmen might become your new favorite way to get around. You have lots of choices for bike riding in Playa del Carmen. There are lots of bike rental shops, as well as many bike shops where you can buy a nice Beach Cruiser or even something a little more adventurous. Playa del Carmen is a rapidly growing city, which means it has the same age old issues as any city in the USA or Canada. There’s a lot of traffic and parking, when available, is at a premium. With a bike, you can get around quickly and easily, often faster than a car in some places, and you will never have to look for a parking space. The terrain is virtually flat, so getting around on a bike is both pleasant and won’t wear you out. There are literally hundreds of miles and hundreds of places to go riding bikes in the Playa del Carmen area. Whether cruising the endless beaches on a single speed Beach Cruiser or climbing the nearby hills of the Yucatan on a 21-speed mountain bike. Make sure to find out where to ride bikes in Playa del Carmen. Some places are not suitable for bike riding and some don’t allow bicycles. Ask for information at the bike rental shop when you rent your bicycle. They are very knowledgeable and will be very happy to let you know all the places where you can enjoy riding bikes. 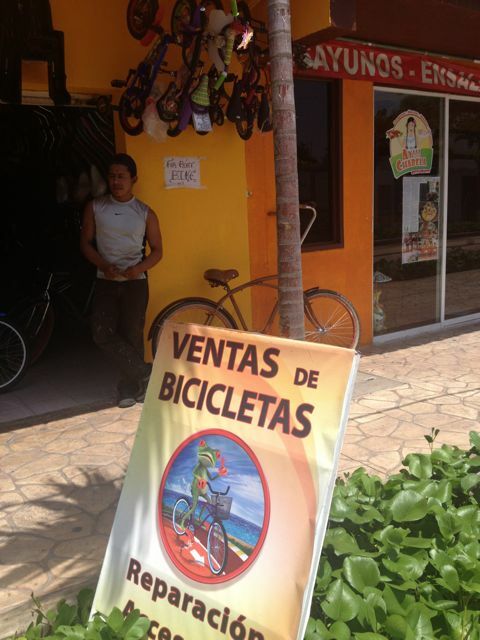 Bike rentals are an exceptionally economical choice in Playa del Carmen. You can rent a bike from many locations for very little. 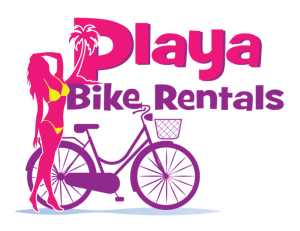 One example is Playa Bike Rentals, offering bike rentals for as low as $5 per day on a two week stay. That’s less than single zone bus fare in most cities in North America, and it offers you freedom no bus ever does. The single speed Beach Cruisers are a truly carefree way for most people to travel anywhere along the beaches and bike routes of Playa del Carmen. Beach Cruisers have a very low learning curve, even if you haven’t been on a bike for years, and the level ground of the many beaches is perfect for an easy return to the joys of bicycling, even if you haven’t been on one for years. Obviously, a certain degree of fitness is required to ride a bike anywhere, as they are propelled by people power, but they are a gentle, low impact way to get some really good exercise, while enjoying the pleasant breezes off the Caribbean Sea. If you’ve fallen in love with Playa del Carmen, which is sure not hard to do, and have decided to stay for extended periods beyond a couple of weeks, you might consider owning a nice Beach Cruiser. There are many shops that sell bikes now, which means there’s a lot of competition. You can buy a brand new basic Beach Cruiser for between $150 and $300, depending on what you want. It’s probably worth spending closer to the $300 for a bike. That will give you a lock (an absolute must) a handy basket, lights, a bell (another must!) a rear view mirror, hand break and a seat that won’t kill your sit-down. Hint: Buy a GOOD lock! If your lock can be cut off with cable cutters, it will be and you will be out whatever you paid – probably sooner than later. A typical single speed Beach Cruiser is the best choice for bike riding in Playa del Carmen for most people. The area is flat, so there’s no need for low gears for hill climbing, and, well… the road surfaces aren’t always such that you’d want to kick it up a couple of gears for high speed. The combination of potholes, pedestrians and speed-bumps will encourage most riders to take it easy and enjoy the sights. For the more adventurous bike riders, there are shops that rent road and mountain bikes, such as Teknobike. Along with their selection of higher end bikes for sale, they also offer bike tours, but be prepared and be in shape if you want to take part. They are for serious riders. Bike tours from Playa del Carmen are an exciting addition for your itinerary. Ride mountain bikes in some of the rugged hills, visit some of the Mayan ruins or take a trip to Tulum and back. Note that it’s generally not recommended to ride bikes on the highways here. Cars, buses and trucks are bigger than you and they know it! The Tulum tour follows with a truck for safety. For additional mountain bike adventure while staying in Playa del Carmen, the Punta Venado Bike Park will thrill you every time you visit. With stunning views, challenging climbs and breathtaking downhill courses, it’s a must do destination for MTB lovers from around the world. Playa del Carmen truly is a bike rider’s paradise. There’s something for everyone, from retirees finally having the time to get back on a bike after years of being too busy, to those who love the adventure of mountain bike riding. Once you start riding here, you’ll be addicted for life.